The CDCN-91 series dual channel conductivity/resistivity controller is a two-channel input device equipped with three scalable 4 to 20 mA outputs and four programmable relays. A selector switch activates two open collector outputs in place of two of the relays for extraordinary output versatility. Dual input and advanced control capability, including percent rejection, difference and ratio calculations, together with the CDCE-91 series conductivity sensors listed below, form the perfect measurement and control system for water treatment applications and more. Two versions are available: one accepts AC line-voltage, the other low voltage DC for power. 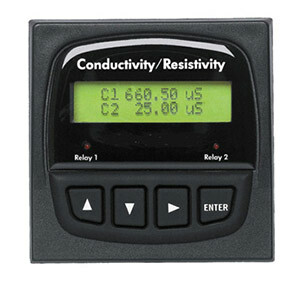 The four-button keypad arrangement with intuitive software design is user-friendly, and the NEMA-4X/IP65 integrity of the front panel can be extended to the entire enclosure by using the optional rear cover kit. Power Requirements: 3-8860-AC: 100 to 240 Vac ±10%, 50-60 Hz, 20 VA 3-8860: 11 to 24 Vdc ±10% reg., 0.5A max. Current Outputs: (3 each) 4 to 20 mA, isolated, fully adjustable and reversible. Open Collector Outputs: (2 each) Isolated, 50 mA sink or source, 30 Vdc max. pull-up voltage. Please download the full product specifications for additional technical information and a complete list of all models available. See CDCE-90-001, CDCE-90-01, CDCE-90-1, CDCE-90-10, CDCE-90-20 for a complete list of available conductivity cells. 참고: Comes complete with operator's manual, panel mounting bracket, and panel gasket. Conductivity electrodes are sold separately.